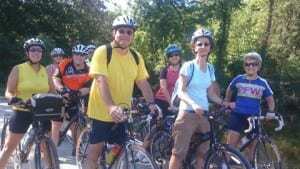 The Princeton Freewheelers are inviting newcomers to join them on Saturday, Sept. 17. Three rides will leave from the Hamilton YMCA at Sawmill Road at 9a.m. : D+, C and B-level rides. The D+ ride will cruise on flat terrain at 11-12 mph (or an average moving speed of 9-10 mph) for about 20 miles. The C ride cruises about 14 mph for about 25 miles and the B ride at about 17 mph for about 30 miles. Most importantly, though, the D+ and C rides are social rides. New riders may expect much encouragement and support. No one will be dropped for going too slowly. This new-member ride has a preliminary stop after 4.5 miles to be sure everyone is in a group appropriate for their ability. That’s in addition to the usual rest and/or food break somewhere in the middle of a ride. Most people who choose these rides enjoy the camaraderie of others who also like cycling, as well as the beautiful scenery. Helmets are required. Riders need to be sure their equipment is in good working order. There will be a brief discussion of safe riding practices for group riding and about the Princeton FreeWheelers (also see the group’s website, www.princetonfreewheelers.com). Snacks will be served. The PFW provides opportunities for recreational bicycling and related activities, including the promotion of safe recreational riding, fellowship among cyclists, advancement of the general interests of cyclists, and education about the rights and responsibilities of cyclists.